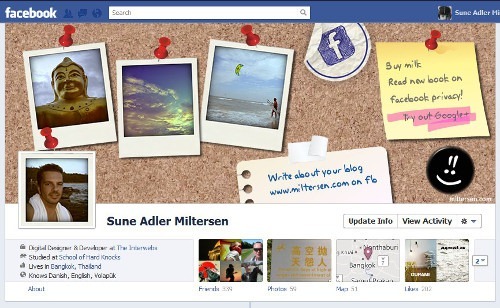 Facebook cover pictures are a relatively new introduction to the world of social networking. Many of us, when first given the option, were slightly overawed about how to fill this extra space. Now however, we’ve had time to consider the benefits of a large landscape-style image at the top of our profiles; so we’re taking the time to consider how we can use it to the best possible advantage. Whether you’re representing a big brand, a small business, or yours is simply a personal profile, your cover photo is the first thing anybody sees when they view your page. If that’s not reason enough to motivate you to take this space seriously, nothing will. Need inspiration? Here are 20 of the best. A timeline from caveman to man geek, this image is ideal for the most obsessive Facebook fans. You know who you are. Ivan Marino innovatively combines his Facebook cover photo with his profile picture to create something quite eery. 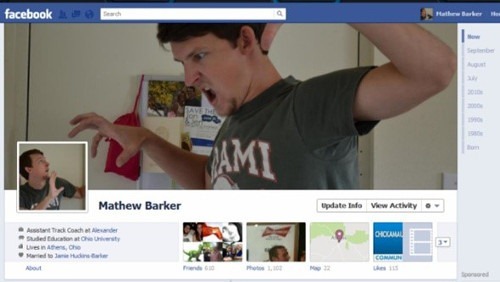 Simple but effective, Matthew Barker uses two images to make it seem like he is scaring himself. This is genius as it can be created by anyone with a camera or smartphone. No Photoshop skills necessary. Dove’s corporate page features fresh-faced natural women on a clean white background. It’s on-brand and simply beautiful. Earth, fire, water and air in glass vases on a black background. This image makes a real impact. Did you know Facebook has it’s own profile? Here’s its current offering in the theme of joining people together. Apt. This is funny because it’s true. Don’t pretend you’re not doing it. Two days until calling the police? In some cases two hours would be the more appropriate time frame. Ever had nightmares about looking down the barrel of a gun? Now you can spread that joy to all your Facebook friends. This cover image should be reserved for days when you’re particularly peeved by boring statuses. We’re talking potty training posts, images of sandwiches, and detailed descriptions of what the dog’s doing. Pinboards aren’t just for Pinterest, as this creative cover photo from Sune Adler Miltersen goes to show. Fun and funky html humour from Jessica Barnard – web designer and self confessed internet beautifier. Great use of creative imagery and combining the profile pic with the cover photo, from this design magazine. Another great combination of profile pic and cover photo, 513art creatively shows life as seen through a camera. Have you ever seen a dog eat its own face? Take a look at the cover pic of Dunder the YouTube sensation. Pointing directly at the profile picture, this is a not-so-subtle way to reveal your secret ninja status. After your 40th invitation of the week, you might be tempted to try out this image. Now… do they make one for Candy Crush Saga? Old school entertainment on a new school platform, this black and white waking man image adds a little traditional comedy to the proceedings. Happy, fruity jelly beans help you brighten your cover photograph. Totally random but completely excellent, the fabulous space cat will make anyone’s day. Whether you’re planning on reflecting your corporate branding on your business’ Facebook page, or your personal profile deserves an overall, you can wow your friends with a fun cover photo. Take inspiration from those you’ve seen today and see what you can come up with. It’s amazing what you can do with a blank rectangular canvas. Susie Francis – who has written 1 posts on Artatm – Creative Art Magazine.